Dimenzije: 22,50 x 26,60 cm. Bogato je opremljena crno-bijelim i kolor fotografijama i crtežima. A New Illustrated History of the Nazis traces the roots of the movement from the end of World War I through to the fall of the Berlin Wall. 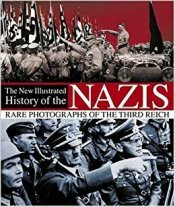 Details are documented throughout with rare archive photographs, examples of Nazi propaganda, political maps and economic statistics. These include the consequences of the Wehrmacht, details of life under the Nazi regime and biographies of the key figures in the Third Reich. Paying particular attention to the holocaust, the policy and purpose of 'total war', the state of German society and the systematic use of propaganda and terror, this book is an essential purchase for the history enthusiast.